Proper core training during and after pregnancy is the most significant thing you can do to improve your client’s health (and if she’s pregnant, her child’s health too). However, when we say “core training,” we are specifically referring to optimizing your client’s deep core function. Doing so can help her prevent pregnancy pains and injuries, enable her to push more efficiently, improve her immunity and digestion, reduce stress, and even create a healthier growth environment for her baby. Optimizing her deep core function comes down to 1) ensuring she’s in neutral alignment, and teaching her how to breathe properly. Proper breathing is the #1 most important movement you can teach any client, especially a pregnant or postpartum client. If she can master this movement, it’s like doing over 20,000 reps per day of the best “core exercise” there is. Let us explain…starting with the most critical core muscles we need to focus on. Optimizing core function begins with training the deep core muscles of the diaphragm, transverse abdominis, and pelvic floor. We refer to these muscles as the “Core Canister” because, as you can see from the image below, they form the shape of a canister at the center of the body. Each Core Canister component plays an important role on its own, but it’s in working together as a unit that you see the greatest benefit. Let’s briefly discuss each component first. Diaphragm (DF): This is the body’s primary respiratory muscle, and breathing is the body’s “master regulator.” Proper diaphragmatic breathing improves focus, reduces stress, enhances immunity, helps digestion, and even delivers increased oxygen and nutrients to a growing fetus. 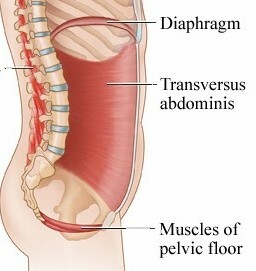 Transverse Abdominis (TVA):This is the body’s “inner girdle.” It’s the largest and innermost abdominal muscle. It supports and stabilizes the spine, and helps resist the anterior pelvic tilt caused by the growing belly. It is also the muscle used to help push the baby out. Pelvic Floor (PF):This is a series of muscles that form a sling at the bottom of the core, often referred to as the “floor of the core.” These critical muscles support the pelvic organs (including the uterus, which grows to about 500 times its original size during pregnancy), stabilize the pelvis, and assist in guiding the baby out properly during delivery. As you can see, each of these muscles plays an important role on its own, but the true power of the Core Canister comes from all muscles working together in harmony as a “pump.” This pumping mechanism helps to dynamically maintain intra-abdominal pressure (IAP). A certain amount of IAP is needed for the core to assist in accelerating, decelerating, or stabilizing any movement. However, too much pressure can lead to injuries like diastasis recti or pelvic floor dysfunction. Avoiding excess IAP is especially important during pregnancy because a growing belly increases IAP, so it becomes very important to carefully manage this pressure, and avoid adding to it. One of the best ways to manage pressure is with a properly functioning Core Canister Pump. So how do we activate this pump? You’ve probably guess it by now …proper breathing, or more specifically, 360° Breathing. 360° Breathing is a style of breathing that ensures optimal use of the diaphragm, and proper pumping coordination of the core canister muscles. Watch this video to learn how to perform it, and how to incorporate it into movement. The goal with your clients should be to train them to 360° Breathe naturally — throughout their workout and their everyday life. So, to recap from the video, use the following progression to teach the technique and then ingrain it into their movements. Master Isolated 360° Breathing. Make sure she understands how to perform the technique on its own in a seated position before you try incorporating it into movement. If she struggles or displays signs of “backwards breathing,” watch this video on correcting backwards breathing for a strategy to help. Incorporate 360° Breathing into movement. Cue her to “exhale on the effort” (during exercise and daily life). Cue this on EVERY single movement during her workout until it becomes natural. Match tension to task. In general, the greater the intensity of the movement, the stronger her exhale should be. While 360° Breathing may seem simple to you, most clients are “backwards breathers” because long periods of sitting (and slouching) essentially “shut off” the core canister pump. So many people have a very weak deep core, and breathe through the accessory muscles of their neck and check — a strategy that actually increases IAP. It is for this very reason, we encourage professionals to AVOID cues like “draw your navel to your spine” or “engage your core.” When we focus only on the “drawing in” action, it will likely lead many of our (backwards breathing) clients to draw in as they inhale — which increases IAP and has the opposite effect of what we want to achieve. Always focus your cues on the exhale. Engagement should come as a result of the exhale. Interested in learning more? Explore our education programs for becoming a Pre/Postnatal Performance Training Specialist.